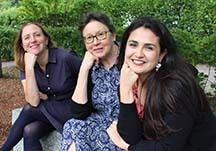 We are Gloria, Renata and Rebecca in Research Services at Andover-Harvard Theological Library. Ask a question or schedule a research consultation. This is a bibliography/webography of digitized publications in the public domain that chronicle major events events in the life of Unitarian and Universalist congregations. Its genesis was a search for primarily pamphlet literature in Andover-Harvard's vast collection that had not yet been digitally preserved (and/or are not freely available). Over 750 Andover-Harvard titles were surveyed and, of these, approximately half were chosen as suitable and potential candidates for digitization. This web guide is currently the combination of the listing of the already digitized and 352 "new" titles that were digitized by the Harvard Library's Imaging Services in the spring of 2015 and the spring of 2016 (to find these works, search HOLLIS for "Andover-Harvard Theological Library pamphlet digitization project. Unitarian Universalist congregations." Also, links to the library's Flickr account are included for the states that also have material in this guide (the complete congregations list on the Flickr account is here). What Is Listed in This Guide? Congregational by-laws, covenants, directories, etc. In some cases, other sermons and works are included. The date scope is generally 1800 to 1922, with a few exceptions. The listings are NOT exhaustive. As additional digitized material is discovered, it will be added. This guide also includes links the small amount of mostly unpublished material in the Manuscripts and Archives collection. To see what is available (mostly not online), consult the Unitarian Universalist Congregational Records page. Then click on a title to view full text. Types of Unitarian Churches. 1915? As with any undertaking of a project and presentation of this size, there are likely to be omissions and mistakes. Please email Research Services with comments and corrections. Copyright © 2015 President and Fellows of Harvard College. All rights reserved.